To state the obvious first: People with an "office job" exclusively process data (emails, telephone calls (audio data), electronic documents, paper documents, personal communication with co-workers etc.). Presuming that the employing organization is profitable, (in a simplified view) the total value of the data processed by those employees must be higher than the total of their salaries. "In their respective realm, Finance and Human Resources a.o. Since any item of the above list is abstractly applicable to the resource Data, I suggest that medium and large enterprises implement a central unit headed by a CDO (Chief Data Officer) who directly reports to the CEO." More precisely, applying the above to the resource Data, the central Data Management Office's tasks include e.g. Question 2: What are the pros and cons of having a centralised DMO versus separate DMOs per business area? Inspired by the initiative of Prash Chandramohan (@mdmgeek) here, below please find some basic notes and recommendations for Data Quality. while avoiding to re-create entities / attributes that are rightfully already defined within the organization. Range of values (where meaningful and possible). 3. Define use cases and related rules that serve a purpose-specific data quality. At least, suggest a use-case-specific selection of values. 6. Monitor the quality of data on a regular basis while applying / interpreting (use-case-specific) rules, e.g. using the Friday Afternoon Measurement (even if it's not Friday!). 7. Provide feedback to business staff and / or business analysts. "Breathes the air of the European Union" means physically is within the borders of the EEA*** regardless of their citizenship. This been said, I believe it is safe to assume that excluding contacts with the EEA is not a sustainable business model. Moreover, a business does not necessarily have any control over e.g. its customers' choices where they may temporarily or permanently be (see also my post here). Complementarily phrased: An organization is exempted from the provisions of the GDPR only if its business is established outside of the EEA, is local by nature and does not process any data relating to natural persons with whom it is in contact for business reasons. ** Personal Data ... means any information relating to an identified or identifiable natural person (‘data subject’); an identifiable natural person is one who can be identified, directly or indirectly, in particular by reference to an identifier such as a name, an identification number, location data, an online identifier or to one or more factors specific to the physical, physiological, genetic, mental, economic, cultural or social identity of that natural person [GDPR Art. 4 (1)]. A logical data model is one of the important milestones on the road to GDPR (General Data Protection Regulation) compliance. Being the blueprint of an organization's semantic data and the relationships among them, the logical data model serves as the virtual hub between the existing physical data stores and the future implementation of a GDPR-compliant data architecture. The logical data model even offers a GDPR-related bonus, as it teaches that being 'personal' (or non-'personal') is not an absolute characteristic of data, but depends on the context in which these data are made available. To illustrate the latter, let's look at an example of a logical data model which presumably represents the business of a B2C online retailer. This model may have been obtained as the result of the process described in my previous post "GDPR - How to Discover and Document Personal Data" or through any other modeling approach. Which of these tables contain records with personal data? As per the definition of 'personal data' imposed by the GDPR ('personal data' means any information relating to an identified or identifiable natural person), the answer is: All of them! Why? Because all tables are 'related' to the table 'person', i.e. there is a path from each table to 'person' (and vice versa). This does not mean that all records of all tables shown here contain personal data, but those records that can be reached through a chain of foreign-key-value to primary-key-value links (or vice versa) from a 'person id' or to a 'person id'. In other words, the existence of relationships (foreign keys) provides the context that categorizes records of data as 'personal' or 'non-personal'. For example, if we isolate the table 'address', its content simply constitutes a list of addresses which may exist in public reference databases such as Google Maps and therefore cannot be considered to contain personal data. 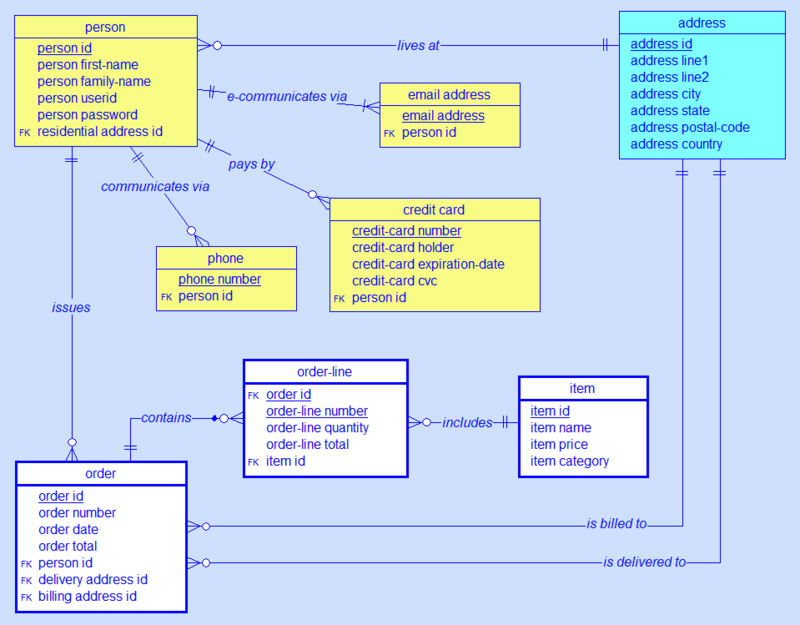 But in the context shown in the above model, those records of the table 'address' that are identified by the value of the foreign key 'residential address id' in table 'person' (or by values of the foreign keys 'delivery address id' and 'billing address id' in table 'order') become personal data. One of the first steps for organizations on the journey to GDPR compliance is to find out what 'personal data' (i.e. any information relating to an identified or identifiable natural person) are stored where. For many organizations, this can be a tedious, cumbersome process, since very often the complete 'list' of all metadata describing personal data is not at hand right from the start. Making matters more complex, personal data's metadata (like any metadata) may be found under a variety of synonyms in different data stores. To streamline the process for data discovery as much as possible, I suggest a sequence of 5 steps which may need to be repeated several times. With each pass, additional personal data and/or their locations may be discovered based on the names of columns / fields added in a previous iteration. The process can be stopped once a consolidated, structurally sound logical data model has been obtained. Create an inventory of all data stores. Record their name, purpose and physical location (device type, country!). Important: Include locations where potential 'processors' (contractors) store business data on behalf of the 'controlling' organization! Capture / reverse engineer the physical model of the selected data stores. 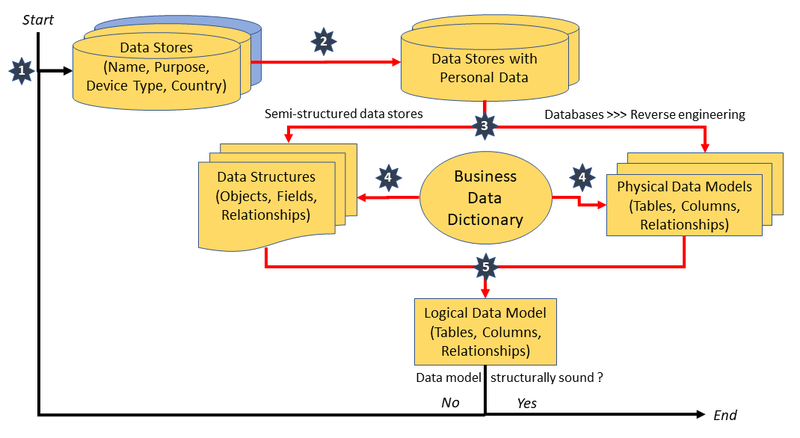 Create / enrich (partial) logical data model using the business data dictionary. Although this is only the beginning of the journey, professional data (and process) modeling tools are obviously necessary on the road to GDPR compliance. (Note: All red arrows in the above image do not only indicate step sequence, but ought to also represent links among the related artifacts in the modeling tools' metadata repository.) Having already a business data dictionary in place and/or logical and physical data models tool-documented will greatly facilitate the process. Stay tuned and read part 2 "GDPR & Personal Data - Context is Key and (Foreign) Key is Context" where I will demonstrate how context is important to determine whether data are to be considered personal or not with respect to the GDPR. When non-European organizations first heard of the General Data Protection Regulation (GDPR), they may have understood it as a European regulation only - and therefore considered it not to be applicable to their business. However, looking closer, it became clear that GDPR applies to all organizations worldwide doing business with European residents. Again, many organizations who do not offer their goods and services to European residents concluded they will not be affected. Wrong! Let's assume the following scenario: It's 2018, and a local bank in Vermont (USA) offers, beside other banking services, mortgages to home owners in the region. Tim S. recently bought a new home which the said bank financed. As it happens in real life, Tim today accepted an attractive professional assignment in Europe for one year. Since he will work abroad only for a limited period of time, he decided to keep his house in Vermont. Tim accordingly continues to pay his mortgage, has a neighbor to take care of his house during his absence and looks forward to enjoying his home after his return. Impact on Tim's bank in Vermont: During the time of his assignment in Europe, Tim will be a European resident and therefore be protected by the GDPR, or - in other words - the GDPR is applicable to Tim's bank in Vermont. Conclusion: The above scenario demonstrates that the need to comply with the GDPR is beyond (almost) any organization's control and that it solely depends on where their clients decide to reside - the customer is king. Dynamic Data Lineage - mapping and tracking the flow of semantic data objects (and their synonyms) from their sources, through the processes and data stores of the organization to downstream consumers. In my post How The GDPR Can Propel An Organization's Informational Infrastructure I mentioned that recording Data Lineage is implicitly required by multiple regulations, most prominently the General Data Protection Regulation (GDPR). Thomas, an EU resident, is client of the online retailer xyzAnywhere Corp. which communicates with Thomas usually by email, but occasionally chooses to send him promotional letters by post mail. Thomas receives some of xyzAnywhere's promotional mail at his current residential address (as shown in his online profile), but also still some of their letters via mail forwarder as they are sent to his previous home. Thomas exercises his right granted by the GDPR to request a copy of the entire personal data that xyzAnywhere Corp. holds about him. Upon receipt of that copy, Thomas realizes that the information provided to him does not include his previous residential address at all. Regardless of how the communication between the customer and the organization may continue and leaving aside whether and how regulatory authorities will consider the case and penalize the organization, we can conclude that the organization failed to comply with GDPR (Art. 15), as it did not make the complete set of the customer's "personal data undergoing processing" available. How could the organization have avoided to fail? Serves to represent a model of Master Entities and their physical distribution. The data modeling tool SILVERRUN fully supports the above criteria and helps you to build a solid foundation for Data Model Management, Master Data Management and Data Governance. 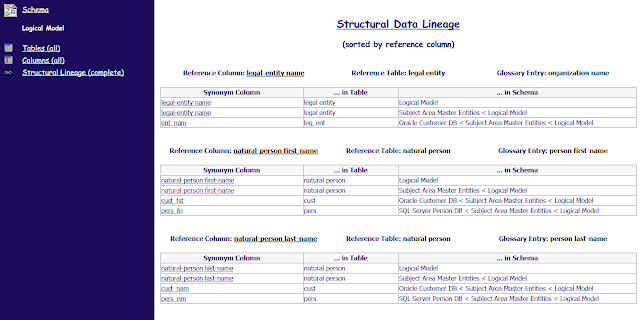 Below please see how SILVERRUN reports Structural Data Lineage which would have helped in the above example scenario to identify all database columns that constitute synonyms e.g. of the data dictionary item "person last-name" and thus define the data model needed to systematically extract all personal data related to a particular customer. To be clear: Links between a data dictionary item (glossary entry) and its synonyms can only be created by "brainware", not by software (alone) since the semantics behind any data object has to be understood first. However, with human guidance, SILVERRUN can integrate the puzzle pieces that may be available through reverse engineering of databases, importing spreadsheets, reusing existing models and accessing other sources of documentation. Once integrated, the resulting data model constitutes the solid ground to build a future-proof Master Data Management system and to flexibly respond to regulatory requirements as e.g. stipulated by the GDPR.